So chances are really good if you have a kid (or grandkid…or kid in your life…) between the ages of 4 and 18, your life has been affected in some way by the slime craze. Slime is an epidemic sweeping the nation, causing parents to acquire obscene quantities of Elmer’s glue and congregate, mumbling incoherently, in the laundry detergent aisle as they hunt down that last box of borax at Target at 10:00 pm. If your children have yet to be affected, just wait. It’s coming. The good news is that it’s easy and it’s fun. 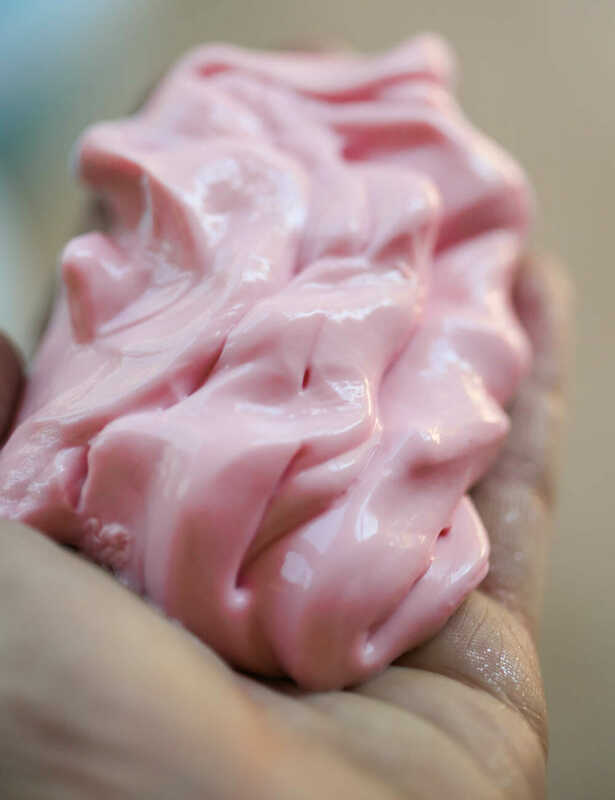 If you’ve never made our “classic” slime, check out the post here and. This particular slime is incredibly satisfying to make and to play with–this makes a big batch, but you’re going to need it all, I promise. You’re going to need some glue (good luck finding any–just buy it online for the sake of your sanity), shaving cream (I like the sensitive skin variety because it doesn’t smell like an adolescent boy who’s discovered Axe body spray after gym class), saline solution (make sure it has boric acid in the ingredients–most in the United States do), water, and borax. Add 2 tablespoons of saline solution and set aside. In a large mixing bowl, combine the glue and 1 cup water. If you’d like to add any food coloring, this is the best time. but you may want to wait and let kids add in whatever they want after the slime is mixed; it’s just harder to incorporate. (A good rule of thumb–use more of everything than you’ll think you’ll need. More food coloring. More glitter. More more more. Slime is an ostentatious activity.) Mix until the glue/water mixture is completely smooth and and colors/mix-ins are evenly distributed. 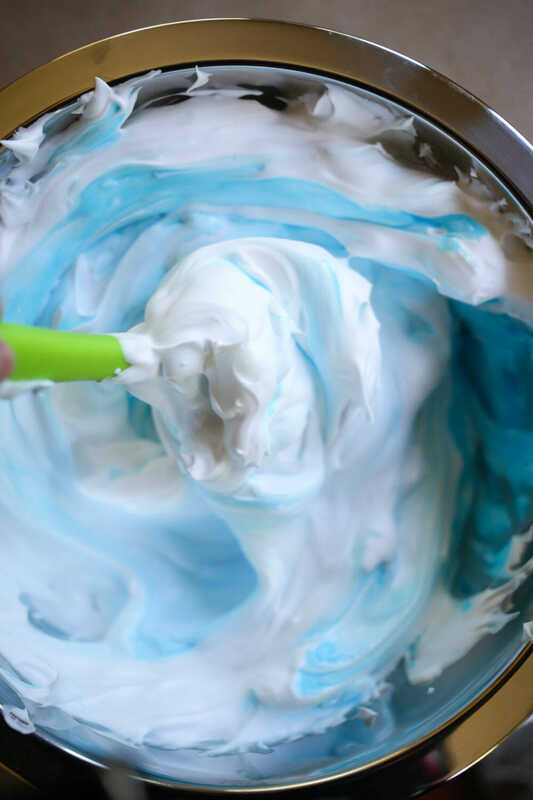 Measure out 8 cups of shaving cream (gently pat it down to make sure you don’t have any large air pockets). 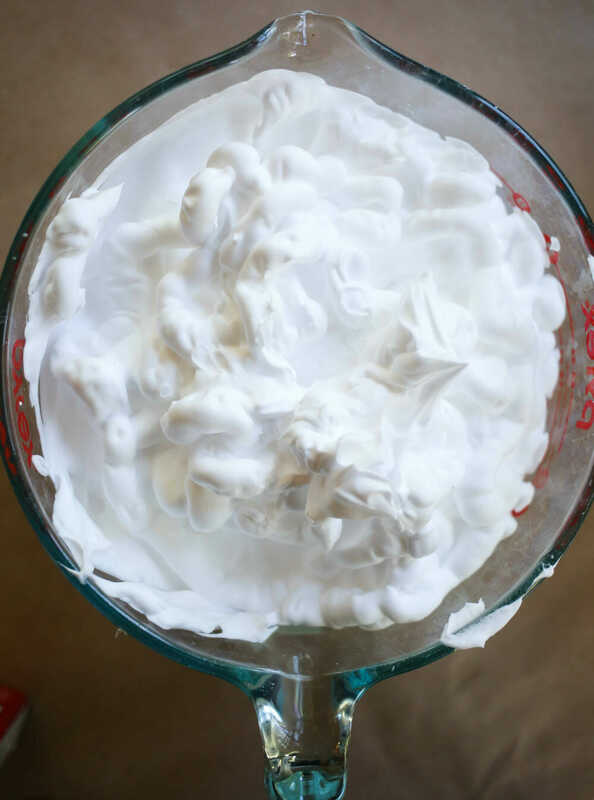 Add the shaving cream to the glue mixture and gently stir until combined. Add the borax/saline solution mixture and mix until combined. The boric acid/borax is what gives the slime its cohesive consistency, so you want to make sure everything is mixed evenly. 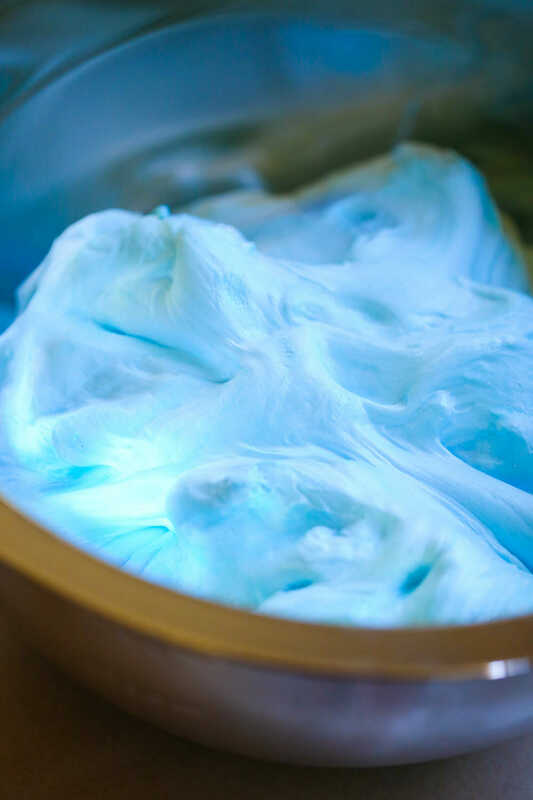 When you first add it, the mixture will seize up, but as it becomes more and more incorporated into the mixture, the slime will take on an amazing, soft, fluffy, marshmallow-y consistency. Check it out in in this video from my Instagram! If you don’t mix anything in, your slime is done! Over time, the fluff will deflate. Store in an airtight container. 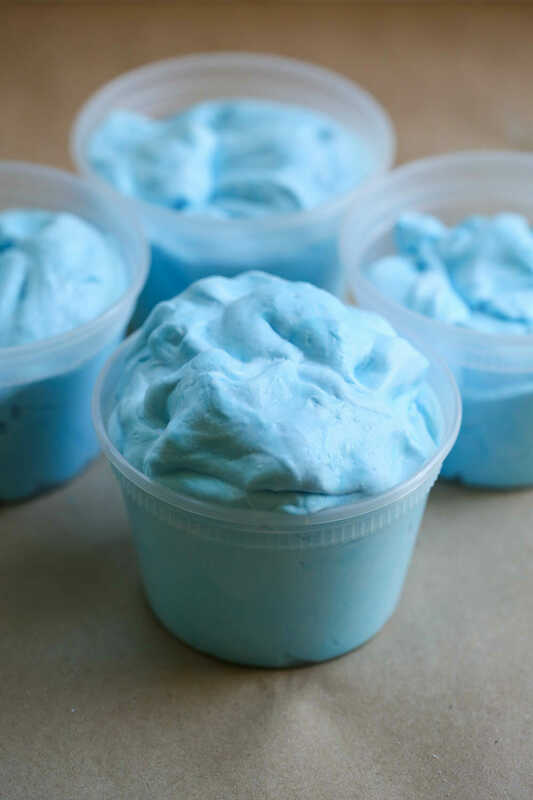 Fluffy slime that is left alone in an airtight container will take on a really great, smooth, flat slime consistency after about a week. 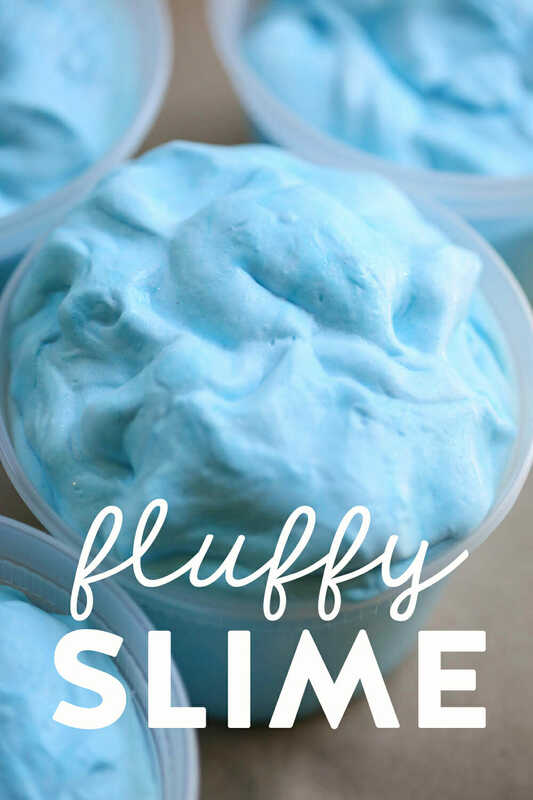 The best, easiest, fluffiest slime in all the land! You’ll love it! 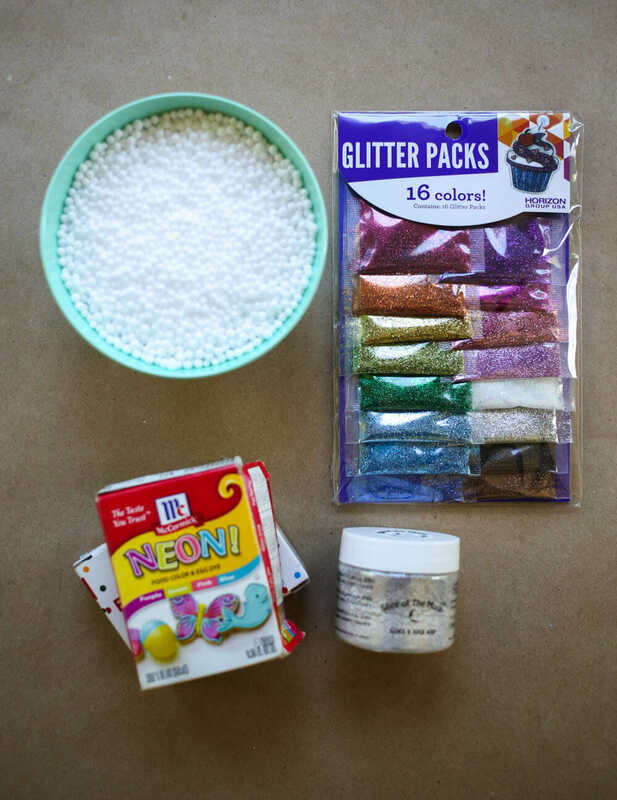 EXTRAS: Food coloring, micro glitter, mini styrofoam balls, etc. 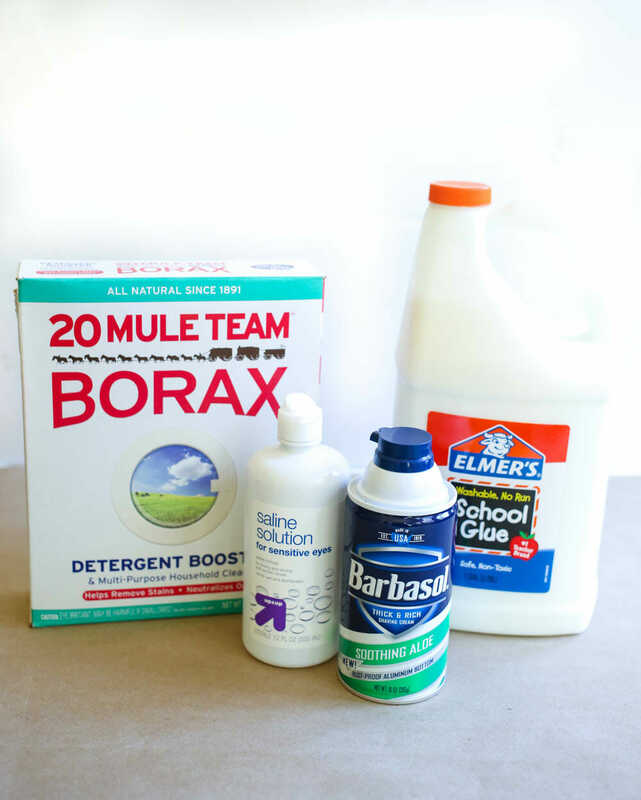 To make the borax solution, dissolve 3/4 teaspoon of borax powder in 1/4 cup of hot water (you’ll need to stir it pretty vigorously to get it to dissolve.) Add 2 tablespoons of saline solution and set aside. In a large mixing bowl, combine the glue and 1 cup water. 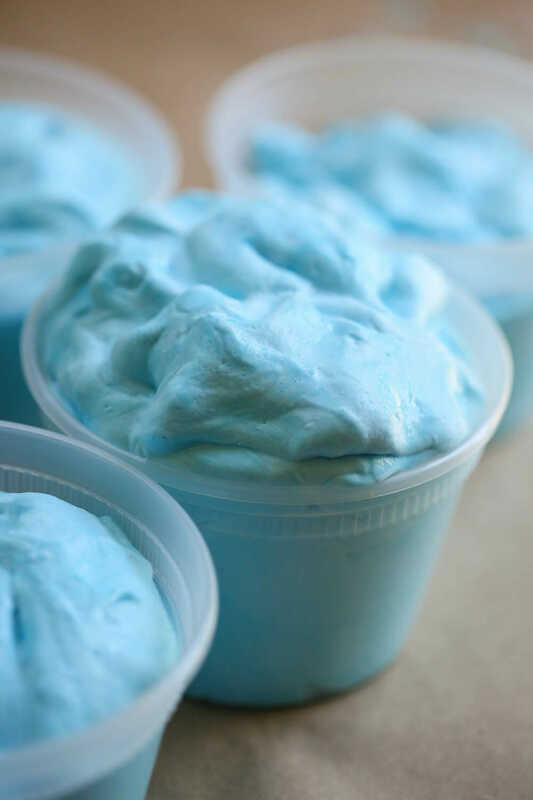 If you’d like to add any food coloring, this is the best time (as well as any mix-ins, but you may want to wait and let kids add in whatever they want after the slime is mixed; it’s just harder to incorporate.) 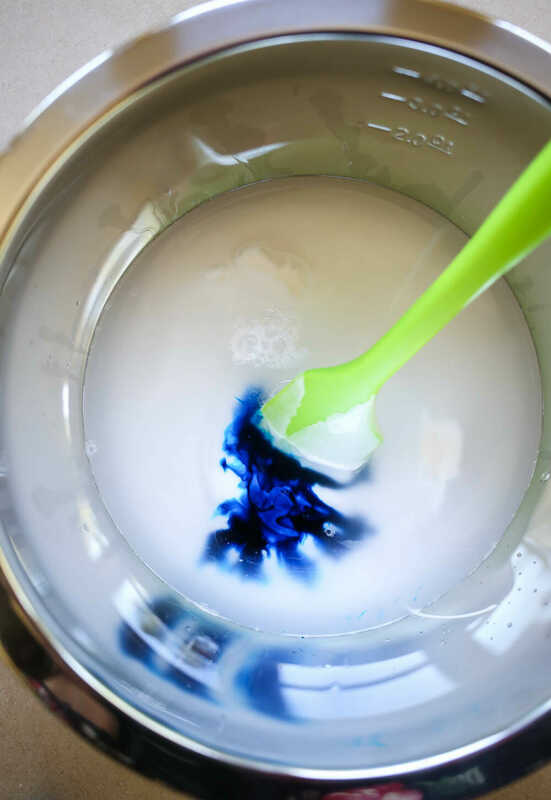 Mix until the glue/water mixture is completely smooth and and colors/mix-ins are evenly distributed. Add the shaving cream to the glue mixture and gently stir until combined. Add the borax/saline solution mixture and mix until combined. 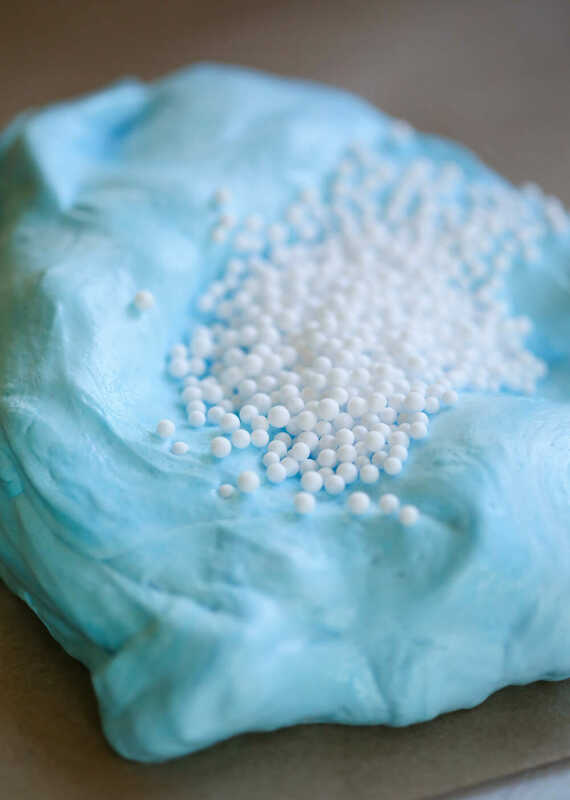 The boric acid/borax is what gives the slime its cohesive consistency, so you want to make sure everything is mixed evenly. 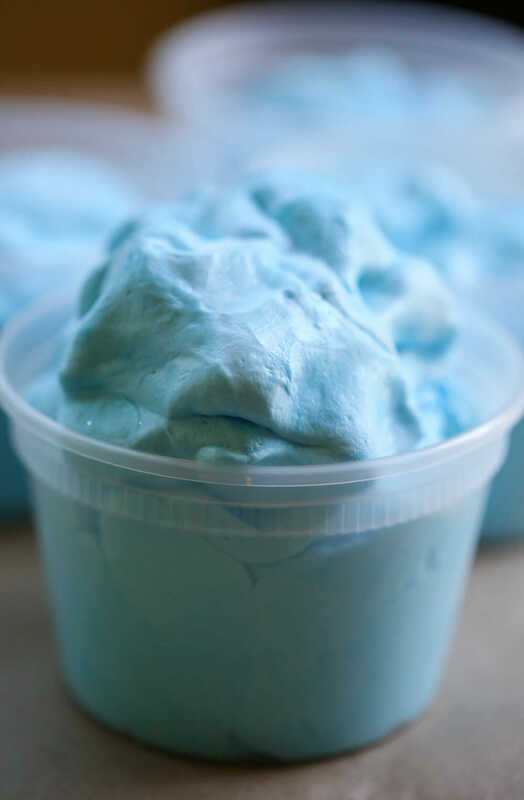 When you first add it, the mixture will seize up, but as it becomes more and more incorporated into the mixture, the slime will take on an amazing, soft, fluffy, marshmallow-y consistency. 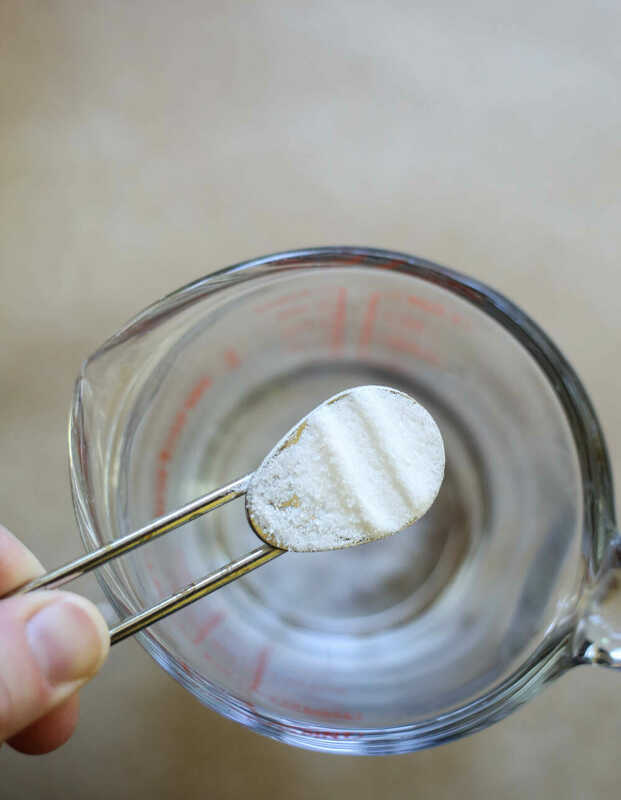 If you’d like a little more firmness, you can add up to an additional tablespoon of saline solution, but start small and add a little as you go. A big bowl…but not an overwhelming amount, especially if multiple kids are involved. So do you know how many of those 16 oz. containers it fills? 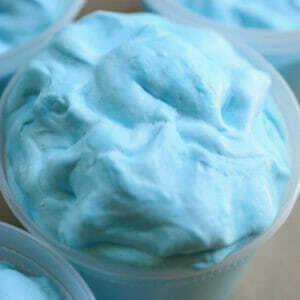 I made 6 batches of Fluffy Slime on Thursday the kids absolutely loved it. Can you use a mixer (like a kitchen-aid) to mix it up? Can it be used for modeling? Does it ever dry out and harden? No, it won’t really hold up for very long if you model it. And it won’t really dry out, but it will get kind of flat and sticky if you leave it out. Loving this idea!! Loving even more the description of the tiny styrofoam balls!! Clean-up is definitely in the realm of Lucifer! Hilarious! You made me laugh today…and gave me a great idea to use with my kids. Thank you!! This looks fun! How may cans of shaving cream does it take to make 8 cups? Will one can be sufficient? *many. Wish I could edit that! My grandchildren are in college so I had no clue why our Kroger had 1/2 gallon and gallon size Elmer’s glue prominently displayed. I thought how odd at the end of the school year that anyone would need so much glue. Thanks for cluing me in–I so hate to be out of loop. Oh the slime craze! I have 3 boys who are ALL about slime! The more, the better…the gooey-er, the better! I can’t wait to try this fluffier version to see what that’s like! Thank you for the add-on ideas! My middle son will absolutely love the glitter addition! Do you have to do your exact measurement? 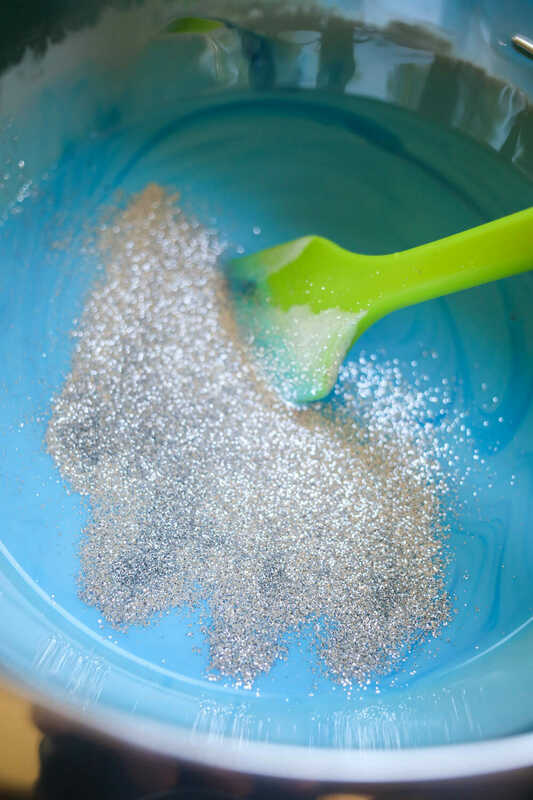 does the glitter transfer to surfaces? I just made this and divided it by 4, using one bottle glue, 1/4 cup water, 1/4 tsp borax, 1Tbs water, 1/2 Tbs saline, and 2 cups shaveing cream. It was a little sticky so I added more saline and it was perfect! How large of a volume did your version make? I am in the process of planning a 4th grade end-of-school picnic for 120 kiddos and they will be making small containers for themselves…containers hold 6oz volume. So trying to figure out how much to order of the ingredients. If the original recipe makes 5 16 oz containers does yours make 1 16 oz container? Kate- can you let me know what brand and oz size on the can of shaving cream you used? Needing for figure how much we will need for 120 kids (see above). On a related note, my head is about to explode. My summer vacation kids and I made this this morning and it was so messy and fun! 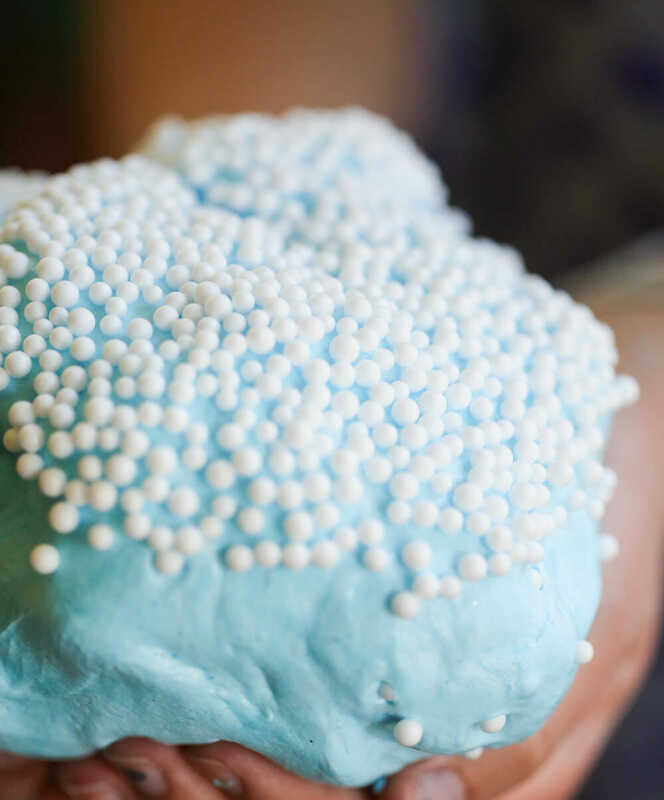 Thank you so much for posting this recipe–we had the best time doing this together and only 1 of them looks like an ice cream cone melted on his head (slime does adhere to hair, turns out!). On a side note: Laura if it’s not too late, DO NOT attempt to do this for 120 4th graders!!! This is a super fun activity for one’s own little family but it is so not worth the work, mess and STRESS for that huge number! Just give everyone a small bowl (use the deli containers!) of water, a squirt of dish soap, and a straw and let them blow bubbles. Save yourself!!! So I’m a little behind but want to do this for about 16 kids. Has anyone figured out the recipe for one portion size? Shaley, this makes a HUGE batch, depending on how much you want to give each kid 1 batch would do (for a small amount) or double would be a generous serving for each. Yay!!! So glad to hear you loved it! This is an awesome recipe. Super easy and I think it makes a ton! My daughter is in heaven. Thanks so much for another foolproof recipe for fun!